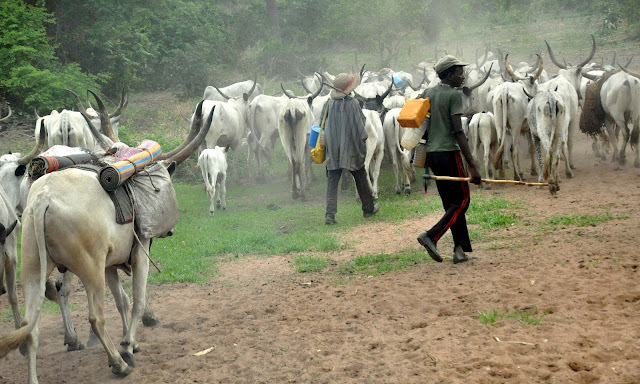 A socio-political group in Imo State, Og­bako Ngor Okpala Youth (ONOY) has raised the alarm over the activities of some Fulani herdsmen in Ngor Okpala Local Government Area of the state, warning that if nothing is done, they may resort to self-help. The group raised the alarm in a letter addressed to Governor Rochas Okoro­cha of Imo State and jointly signed by Comrade Henry Uzoma, President and Com­rade Chinedu Opara, Secre­tary of ONOY. According to them, the activities of the herdsmen who they described as ma­rauders was unbecoming because of their gory activi­ties and bloodletting. The group alleged that the invasion of Umuohie village farm lands by herdsmen portends grave consequenc­es for the totally agrarian community. They explained that the activities of some terrorist-like herdsmen have left scores of people dead in Ag­atu and Zaki Biam in Benue State, Nimbo Uwani in Enugu State, noting that till date nothing has been done to correct the trend. The group called on Gov­ernor Okorocha to stop the potential threat to peace and restore security in the land. Comrades Uzoma and Opara accused the Divi­sional Police Officer (DPO) of Umuneke police station of bias as he directed villag­ers to pay for a missing cow while nothing was done re­garding the destruction of farmlands and livelihood of the owners. Further, the group ap­pealed to Governor Okoro­cha to reach out to the State Commissioner of Police, Mr Chris Ezike, who has already held a meeting with stake­holders to look beyond the surface to avoid escalation in future.